There's been a whole lot of gardening going on at Hoe & Shovel over the past couple of weeks. And do you want to know every little thing about what I've been doing? I kind of doubt it since it mostly involves fall clean up projects. Lots of trimming. But also I've done some planting. So far I'm working away at a good trimming and pruning of the shell ginger, the confederate jasmine that grows along the length of a 30 foot fence, the snow bush, the plumbagos, the palmettos, the schefflera. Just about everything has or is needing a good tweaking to ready for the winter. I still have a list a mile long that I won't bore you with... well, maybe I will in another post. While all these hours of gardening ensue there are so many wonderful creatures that keep me company. I already showed you the peacocks that came strutting through the garden this week. I'm so thankful the mild weather here is suitable for year round butterflies and wildlife activity. They are such a pleasure to observe in all their colors and forms floating about the garden. I'm often distracted by their follies. This was the first time I've photographed the Queen Butterfly. I believe this is the male. He's a bit tattered and torn. As is this monarch on the tippy top of the flax lily btw. And another on the scarlet milkweed. 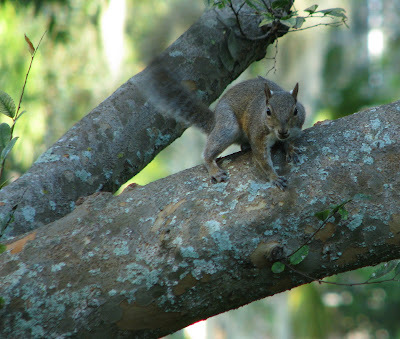 I don't usually even care to photograph the squirrels since they are such an irritation most of the time. But they are kind of cute I admit scurrying about these days picking up fallen acorns and hiding them or perching to eat them. 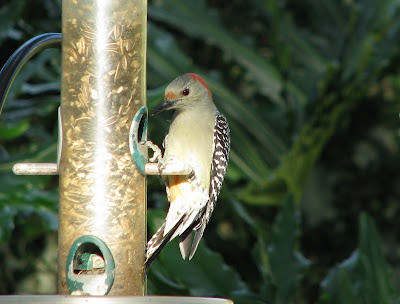 Red Bellied Woodpecker in a quick visit to the bird feeder. We got some blessed rain yesterday and all is clear and bright today. We are slated for our first "real" cool front this week. Woo-Hoo! Highs in the mid 70's by the middle of the week. I'm looking forward to gardening Monday in some autumn coolness. Fun wildlife pictures Meems. I could even see the Woodpeckers red belly. We are getting our first cool weather too. Much cooler than your area but I love it when it is like this. I would like to know if and when you can prune Gardenias...Love your photos and please bore me anytime with info from your BEAUTIFUL Gardens..
How fun to have butterflies throughout the year. I miss them already! Yippee! Hoe and Shovel is back on picks at Blotanical! I'm glad your fix worked Meems. Great wildlife shots. I enjoyed seeing the peacocks too, while visiting Hoe and Shovel earlier today. Your tropical paradise is teeming with life. I'm glad you're getting some relief from the heat finally. We still haven't had a frost here yet, but the winds of change are blowing very strongly tonight, and we expect temps in the 20's next week! Brrrr! Lisa: Thank you. 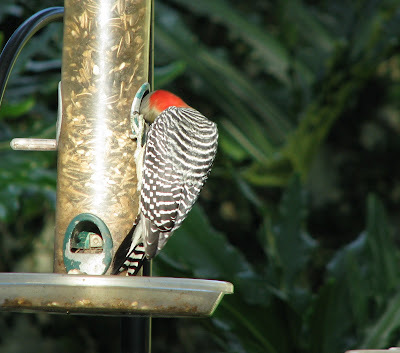 I just love those woodpeckers and they don't visit the feeders too often. I surely look forward to some cooler weather. Darla: I would trim them now.Then as they might get a stray branch here and there you can just trim the stray right through the spring. Linda: Oh my, 20's already. I'm glad you have all your little plant family tucked away safe and sound in the basement. Those peacocks are something else. They were back today. Not here but I heard them in the distance again. It does feel like I'm not so alienated now that Blotanical is working for me again. LOL thanks for visiting... always my pleasure. Looks lovely. We will be missing the butterflies in just a couple of weeks. it is all worth it when you get to see and photograph these beautiful creatures. 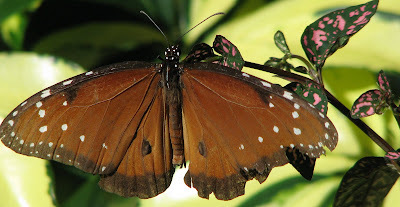 i love the mostly brown butterfly. they all look amazing. i would be distracted too with all those gorgeous creatures flying and flitting around. enjoy your cooler temps, great working weather. 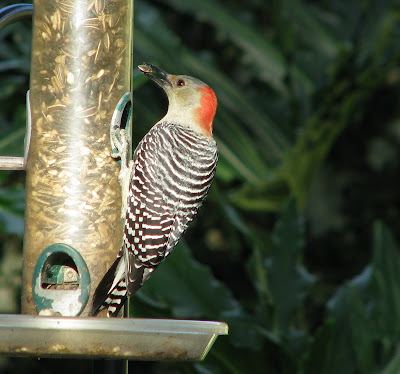 We had a red-bellied in our yard today too. Or at least I assume that's what it was based on your photo and ID. Its been over 3 years since I've seen a pileated. I enjoyed all of your wildlife shots, from the 2 legged to the six legged. It is hard not to admire the squirrels when they are working so hard now gathering their supplies. My squirrel gathers spruce cones almost as long as it is, and runs from the front yard to the back to pile them under the willow. I'm not sure why it can't pile them under the spruce tree where it collects them. 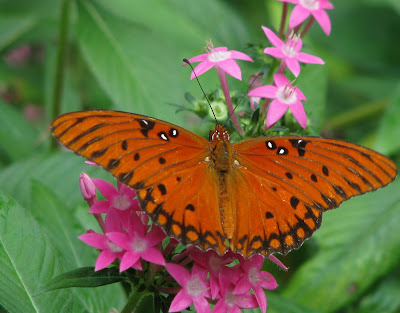 Aunt Debbi: I suppose all the butterflies are making their way south with the colder winds blowing. Cameron: Gosh, you say the nicest things. In truth I don't leave that often because I'm always working in it. Ha. Marmee: Can you believe I have that very same pitcher? I got mine years ago at a small shop out in Lutz that isn't even there anymore. I'm glad you enjoyed the butterfly photos. They are a treat to have around all the time. Robert: the Red-bellied's are fairly common and we also have the Pileated on a regular basis. mjm: Oooooh yeah... I am SO excited about the cooler temps coming. You are right about exercising too. This morning I jogged longer than I usually do (which isn't much) because it "felt" good. Lucky you to have butterflies all year. I love the woodpeckers, don't you? Those peacocks are fascinating. I'm glad they only made a brief stop though, and didn't damage your garden. They might be a mixed blessing! Over here in Charleston, we are starting to slow down in the garden. My Alocasia 'Portodora' is starting to feel the cool 50 degree nights. Not having it! Love your butterfly shots. Lovely shots, Meems. 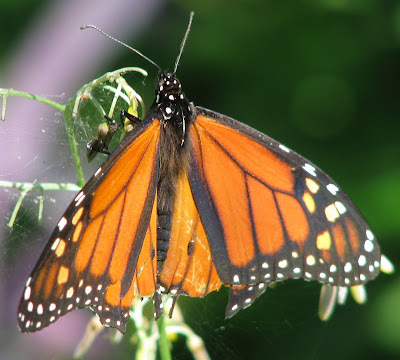 I have to wonder about the tattered Monarchs. I guess they've decided not to head south, or more south. 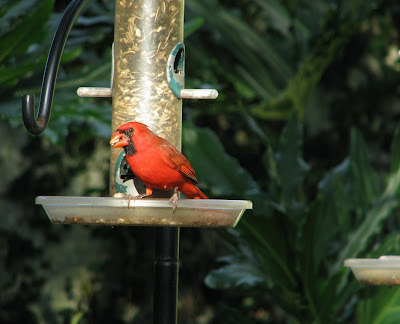 We have an abundance of Red Bellies here in Maryland, and they come to the feeder, but more in winter than summer. We hear them calling in the trees, too. While I love them, I love our Downies better, just a bit. Do you have Downies there? Hi Meems, I wanted to leave a comment when I had time to put some thought into it for such a fabulous post. Your butterflies all year is envy provoking! We occasionally see one on a warmer winter's day, and I wonder what will happen when the cold returns, poor things. They need to get a move on down to FL! Year around growing season means year around pruning and tending, I know from living in Southern Cal and Texas, no rest period to just dream about the garden that could be, or do you do that in summer? can i come by and visit in person? LOL your garden is magnificent!! Dear Gail, I'm beginning to think it is the critters who are dong the whispering. I simply have to stop what I'm doing to pay attention to them when they are so nearby. Enjoy those cute little skippers and cabbage patch while you still may. The skippers have been especially active here all summer. I suppose they, too, shall hang around as long as the blooms of the lantana, mexican petunia, blue porterweed continue. kerri: The woodpeckers are a favorite. I'm watching one right now as I sit on my back porch. It is perched on a close bird feeder. Critters are so much fun to observe with their natural antics and beautiful characteristics. It's free entertainment! the peacocks are magnificent to see but I admit I would hope they don't choose my garden to take up residence. An occasional visit is fine but nothing permanent please. Compost in my Shoes: Hey, that happened to me yesterday. Even though I had my muck shoes on that rich stuff snuck in anyway as I was pitchforking some into the wheelbarrow. :-) Alocasia does not like the cooler temps. Even mine will disappear in December likely and return full force in March. They are magnificent plants though. kim: we actually will enjoy the monarchs all year long. The tattered wings are a sign of age usually. But their wings are tender things and can easily be nipped away even from bad weather. We do have downies. Here's a short video from a previous post. I do love watching them in the trees as well. Often they are right along side of the red-bellieds. 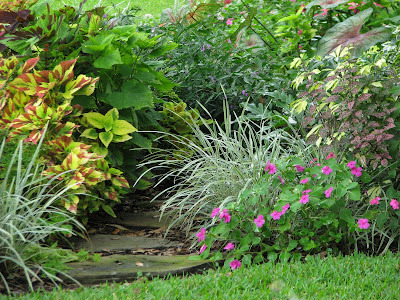 Frances: you gave me a chuckle with the summer dreaming thought... although the garden peaks in June, it is true summers are the time to dream of cooler temps and easier times in the garden. It is a year round endeavor to keep up with the growth in this warmer clime. Just about the time I think I can take a break, I realize it is not true for long. Neglect for any amount of time is a two edged sword. Send your stray butterflies down this way while there's still time... we'll take good care of them for you! Lovely photos. Our gardens are finished for the season. I like coming to visit yours. Hi Helen, Thank you-it makes me happy to share my garden. Anytime you want to visit... my garden gate is always open! Wendy, I must say, I can't even imagine saying the word "finished" when it comes to gardening. There is always a list of things to do. Please do come visit when you need to "think" about gardening. I had to laugh when reading your post, because I, too get sidetracked by the critters, whether I'm taking their pics or just watching them. It's a fun part of gardening. 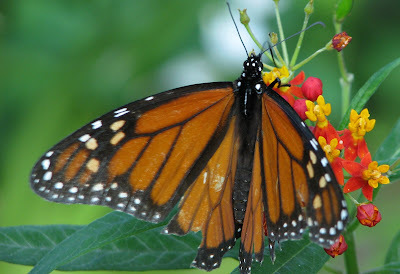 I loved looking at your pics of butterflies and birds we don't have here in Nebraska. I also checked out the peacocks. Oh, we do have squirrels, though, and even though we are not friends, we put up with each other peacefully, most of the time. We do scold each other from time to time. I don't like it when they dig up my plants.